July 4th is a time for family, friends and food, sometimes in that order, other times in reverse! This year I wanted my bbq to end with a red, white and blue pie. The red was easy because the raspberries are gorgeous. The blue was easy because the blueberries from the great state of Maine are nice and plump. It was the white that was presenting a challenge. The crust is whiteish when it is raw, but I don’t really think that counts for the white in red, white and blue. Yet, I needed white to make this dessert July 4th appropriate. What a dilemma. Then I walked down the ice cream aisle in the grocery store and I knew exactly what my white would be…Haagen Daz Vanilla Ice Cream. Phew, disaster averted. I liked the idea of making a more rustic looking pie. I made one pie crust that was large enough to roll out and then partially flap over the fruit once the crust was filled. I did not want an overly sweet filling because the fruit and the vanilla ice cream are sweet enough on their own. If you like a sweeter filling, add ¼ cup more sugar. How did everything work? Beautifully. Red White & Blue Pie will most definitely add a spark to your Independence Day. Happy 4th of July! Combine flour and sugar in a food processor. Pulse on/off to mix. Add butter and pulse on/off until butter is size of baby peas. While using pulse on/off button, add ice water 1 tablespoon at a time. Mix only until dough becomes a ball. The dough should not be wet and sticky. Shape into disc and wrap in wax paper. Refrigerate for at least one hour. Preheat oven to 400°. Set aside 9” pie plate. Combine blueberries, raspberries, flour, sugar and butter into large mixing bowl. Very gently stir to combine. Set aside. Roll out dough, either on a lightly floured surface or between sheets of wax paper, so that it is large enough to fit into pie plate with a 2” overhang of pie crust that will be used to fold over fruit. Spray the pie plate with cooking spray (i.e. Pam) and transfer the dough to the plate. Brush topping over inside of pie shell. Transfer fruit to the shell, scooping flour/sugar mixture with fruit. Fold dough overhang over fruit. This will not cover all of the fruit. Brush exposed dough with topping and sprinkle sugar on top. Place pie plate on baking sheet. Bake in 400° for 35 minutes. If crust is getting dark, tent aluminum foil over pie and continue baking for another 15-25 minutes until pie is bubbling. Cool completely. Slice and serve with Haagen Daz Vanilla Ice Cream. If you prefer a sweeter pie, add an additional ¼ cup sugar to filling. Haagen Daz is my go-to vanilla ice cream. Choose whichever is your favorite to add some ‘white’ to your Red White & Blue Pie. The pie looks fantastic Betsy! 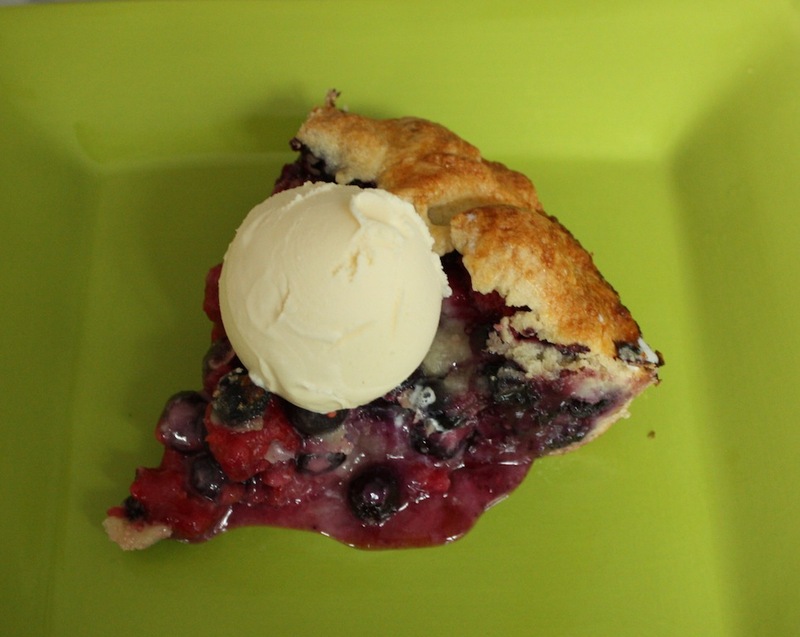 Got all my fave fruit and the best part, the pastry crust and the ice cream…. I saw your comment on CCN about liking everyones FB page, that’s so nice of you! I’m just wondering though, what else do we do with the CCN? I don’t get any visitors from the CCN on my site or any comments from CCN members on my posts. There’s got to be more to this than just a FB group. Thank you so much for ‘liking’ my Facebook page and for commenting here! I love the feedback. In terms of CCN, I have learned a lot from many of the fellow contributors. I figure it is great exposure and eventually TDM followers will find their way over to Desserts Required. In the meantime, it is fun to meet and chat with fellow bloggers and discover new recipes and techniques.